In Ardèche and Auvergne, pristine nature, rich history, and a laid-back atmosphere are the perfect backdrop to a luxury camping break. Book your next camping break with LUX-camp to find out for yourself what makes this area so special. Why should I camp in Ardèche and Auvergne? 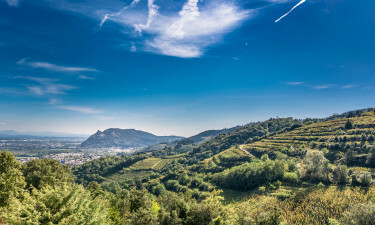 A fertile region that produces exquisite wines and a sumptuous local gastronomy. A rich cultural heritage involving arts, crafts, and traditional celebrations. A natural paradise that will delight outdoor enthusiasts or those looking for a serene environment. A wealth of luxury camping sites strategically located near the top landmarks. Experience the great outdoors like never before by exploring the region's volcanoes, vineyards, wildlife parks, cycling trails, and hiking paths. 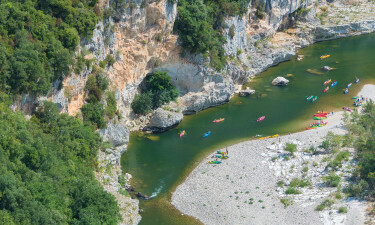 This is one of the top extreme sports destinations in France, as the region's rivers, lakes, and gorges provide ample opportunities for kayaking, white water rafting, paragliding, canyoning, and more. A 5-star campsite boasting an enviable location in Ardèche, a waterpark, exclusive wellness facilities, and first-class accommodation in beautifully appointed mobile homes, stone cottages, and lofts. This is the ideal place to relax and unwind near the spectacular Ardèche Gorges. The highlights of this site include 2 and 3-bedroom mobile homes, a dedicated Zen Area, a huge waterpark, and a privileged location along the Chassezac River. Perfect for watersport lovers thanks to its location a few steps away from a pristine river. Accommodation is available in modern mobile homes with views to the forest or the river. Dozens of river beaches dot the landscape in these French regions. Enjoy a picnic with the family at the beach or go for a swim in the crystal-clear waters of the local rivers. If you're feeling energetic, countless options are on offer, including caving, mountain biking, canyoning, or accrobranching. 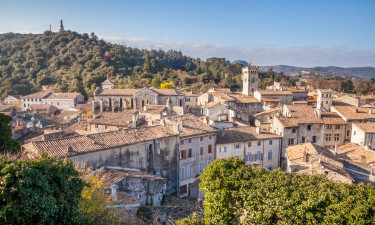 A camping holiday in Ardèche and Auvergne is also ideal for urbanites. Shop for antiques or unique fashion items at Clermont-Ferrand's boutiques, get tickets to the Vichy Opera, or go on a fascinating culinary voyage in Tournon-sur-Rhone. Discover the heart of France on foot by going on a day hike at Puy de Dome, where marvellous vistas await you. 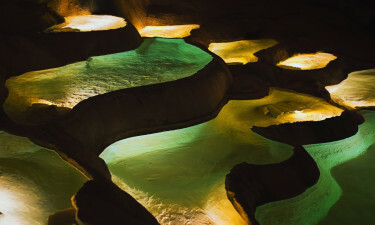 After all the hiking, relax at the sumptuous Byzantine baths in la Bourboule. Also in Auvergne you can follow the Castle Trail, which consists of more than 40 imposing castles. Learn more about the Auvergne volcanoes at the interactive Vulcania park, an excellent choice for a family day out. 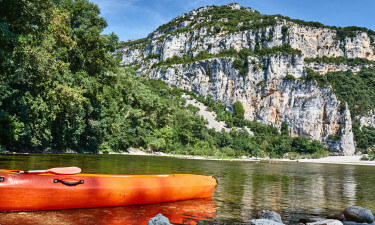 In Ardèche, you can go on a fun adventure by taking the velorail through the imposing Gorges Du Doux, or discover the fascinating cave systems at Forestiere or St-Marcel d' Ardèche. You'll be also spoilt for choice in terms of cultural attractions: museums, art galleries, and summer festivals will keep you entertained during your camping break. Dozens of Michelin-starred chefs put their creative skills to good use throughout Ardèche and Auvergne. But perhaps you'd prefer to get introduced to the local food by following the Auvergne Cheese Trail, where you can find your favourite among 5 prestigious PDO cheeses. Since you're in France, why not celebrate your stay with a glass of local wine? Fruity Auvergne reds or award-winning Saint-Pourçain whites or rosés: the choice is yours. Summer is the best time of the year to go on a luxury camping holiday in Ardèche and Auvergne. Average temperatures remain pleasant even during the hottest months (20 to 25°C), which means that you will have plenty of opportunities to comfortably explore the great outdoors in this part of France.